Here's another cool player recommended to us by my OZ connection. There are always great Blues players coming up in the UK. They seem to have a perpetual Blues machine over there! Matt Schofield's '61 burst through a Two-Rock amp helps him get a nice thick, fat tone. Leaning heavily on Albert Collins, Matt still mixes it up well without going too SRV on us or anything. I dig that he doesn't rush things and doesn't over-play. Even though the above video is a slow number, other up-tempo clips out there show that Schofield keeps his cool and chooses his phrases carefully even when burning it up, similar to Joe Bonamassa, Derek Trucks & Robben Ford. I don't see a whammy bar in this vid, but it's NOT a hardtail. 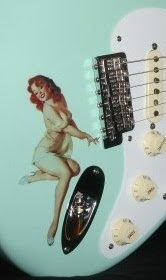 The '61 also sports Fralin Vintage pups, 6100 jumbo frets and is strung 11-54 (Pass the Superglue! This ain't no little girly-man set up folks!). Another very cool thing is that Matt's band is an organ trio, utilizing Jonny Henderson on the Hammond B3, instead of a standard bass, making for some nice grooves and broad voicings. Drummer Evan Jenkins does a great job building with the dynamics in this clip. Who says slow Blues is boring? So many SRV wannabes out there play waaaay more notes than Stevie did, so it's always good to hear players with vocabulary who can handle the reins.